From 1966 to 1969, Leonard Nimoy played Mr. Spock on the original Star Trek series. Those three years as a half-human, half-Vulcan science fiction character would change his life, making him the public face of one of the most popular franchises in television history. But there is an intensely private, spiritual side of Leonard Nimoy that isn’t as well known. The son of a barber, Nimoy grew up in an Orthodox Jewish family in Boston, where he became captivated by the mystery and poetry of Jewish rituals. His interest in Judaism has stayed with him, informing his work as a poet, photographer, and even his portrayal of Mr. Spock. He spoke to Nadine Epstein, editor of Moment Magazine, the national independent Jewish publication co-founded by Elie Wiesel. This is part of our collaboration with Moment that explores great Jewish artists and thinkers. There is a second installment that includes the above interview and adds physicist Brian Greene's thoughts on extraterrestrials. An interview with Star Trek actor Leonard Nimoy, the religious implications of finding intelligent alien life, and the deeper meaning of studying the cosmos. In Boston, references to a place called the “West End” often provoke quizzical looks. Where is it? What is it? The West End, in a nutshell, is the area between Beacon Hill and North Station, near Mass. General Hospital and Mass. Eye and Ear Infirmary. The streets are tangled, dominated by huge hospital buildings, residential towers, and parking lots. It wasn’t always that way. There used to be a tight urban neighborhood there, much like the North End. But it fell victim to the 1950s “urban renewal” craze, when the Boston Redevelopment Authority leveled whole neighborhoods in favor of modern “super blocks,” like Government Center. Yes, the man who played Mr. Spock on Star Trek was born and raised in the West End and often speaks fondly of his Boston roots. That’s at least part of the reason why Boston University invited Nimoy to address graduates of the College of Fine Arts on Saturday. Radio Boston‘s Adam Ragusea attended and spoke backstage with Nimoy. Leonard Nimoy is coming to Dallas and KLUV radio talked to him on the phone about him doing a voice for Transformers, the Vulcan salut and his photography. Before heading out to Dallas Comic Con last weekend mzLive talked to Mr. Nimoy on the phone about the upcoming Transformers movie, donating his archives to Boston University, doing a William Shatner impression and more. Listen to the interview or download it here. Last year a lot of articles were written based on a conference call interview organized by FOX with Leonard Nimoy where he talked about Fringe, his announcement to retire and more. Rock On Request Magazine posted an audio file running a little over 18 minutes of this interview here. It's available for download too. A transcript of the interview can be found at Fringe Bloggers. Leonard Nimoy has been in more than 50 movies and television shows, while most people still know him as Mr. Spock from Star Trek, underneath the alien ears lies an artist who wields a camera instead of a Vulcan salute. Listen as independent producer Michael Krall brings into focus Leonard Nimoy's other calling: photography. Another piece about Secret Selves on wbur.org radio. The page also offers a transcript of the interview. BOSTON — Actor Leonard Nimoy, known to so many as Mr. Spock on “Star Trek,” has another side. He’s also an enterprising photographer. A solo show of portraits by Nimoy, called “Secret Selves,” just opened at MASS MoCA in North Adams. And a retrospective of his work is on display at the Michelson Gallery in Northampton, where we met up with him recently. We found Nimoy’s show to be part art, part therapy. For so many years, Nimoy played a logical, pointy-eared Vulcan. But the lifelong actor has been contemplating a deeply human inner conflict ever since drama school. The Greek playwright and philosopher Aristophanes was also taken by this idea. He dreamed up a wild notion that humans, at one time, were double-people — with four arms, four legs and two heads. We were powerful in that state, and we angered the gods. So Zeus split us in two. Since then, Aristophanes postulated, humans have been full of anxiety, trying to re-integrate and feel whole again. Well, now Nimoy knows. Nearly 100 Northampton area residents showed up for a casting call at the Michelson Gallery last year. They brought costumes and props to an event that sounds like a Halloween party with a therapeutic edge. The podcast for the radio program is available here. The interview, by phone, starts at 1h20m. On his blog the interviewer elaborated a bit on how he met Mr. Nimoy and his thoughts on the occasion. We talked to Nimoy today on the show and it allowed me to convey to him how his life was something of a beacon for one confused teenager just starting out. Back in 1974 the staff at the Cherry County Playhouse was thrilled to have Nimoy that season. He was a big TV star from "Star Trek," but they didn’t want any funny business from the young apprentices. We were told in no uncertain terms that Nimoy hated the whole Vulcan hand gesture Spock thing, he was a serious actor/ artist, and if we were caught joking around and referencing any Trekkie stuff during his stay we would be sent home. Yikes, the warning scared us all pretty good. Nimoy flew his own plane to Northern Michigan with his young daughter, Julie (who was immediately the object of the affections of some of the apprentices — not me). He was a very erudite, lovely man. I wondered why he was so bitter inside about Spock. "Star Trek" was just another cancelled TV series back in 1974 and the coming global cult immortality of "Star Trek" and Nimoy was hard to envision. I thought it was so sad that Nimoy felt he was in this box as Mr. Spock. Years later when Nimoy came back to the movie versions of "Star Trek" and even directed one of my favorites ("The Return Home") I felt that he had found a certain kind of redemption by embracing his inner Spock and becoming a gigantic star for all time which was hardly limiting and in fact led to many more acting opportunities. 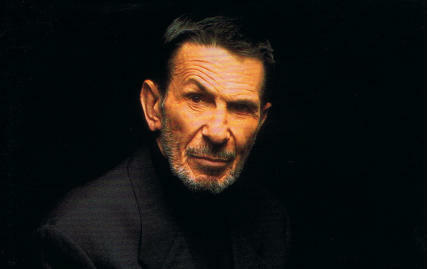 Nimoy is also a regular voice for public radio listeners on "Selected Shorts" among other programs. But I kept that summer stock theatre experience as a parable whenever I was worried about whether I was chasing or being chased by my fears and dreams of what I would do with my life. It was thoughts of Nimoy embracing Spock that helped me to embrace the task of writing a memoir about my experiences as a man in a wheelchair and a global reporter back in the early nineties. That became a successful book “Moving Violations,” which still sells even though it is desperately in need of a sequel, five kids after it was originally published. Today on the show I got to ask Nimoy about the admonition to not mention Spock around him back in 1974. He laughed a big long laugh, remembered vividly that summer and even little old me, and insisted he would never have made such a rule. “I’ve always been a very happy and grateful guy.” He said. Hey Leonard Nimoy, that makes two of us! Thanks for the memory, Mr. Spock. Live long and prosper! Listen to it here. A recap can be found at Trek Today and Trek Movie. Note to people using Internet Explorer: please go directly to the website to listen to the interview as it won't display the embedded player correctly. Nimoy now shares the role of Spock with actor Zachary Quinto who plays a younger version of the character in the new Star Trek film series. Nimoy says he's pleased with the work Quinto did with the famous character. "It made me very proud that the character was strong enough that it could be passed onto someone else so successfully. I'm very proud of him. I'm very proud of the movie." Leonard Nimoy gave an interview by phone to the David Boze Show at MyNorthWest yesterday. They talk about William Shatner, the impact on the science community he'd had, him being in Abram's Star Trek movie, Galaxy Quest, directing comedy, guest starring in other franchises and he doesn't need the money, so why is he doing it to himself going to these conventions. Then the show moves on to take callers for Mr. Nimoy. Topics included his poetry, photography, Roddenberry, Devil in the Dark, did he keep any mementos from the show, In Search Of..., the next movie, and Star Trek and Spock helping one of the callers through a difficult time. The part with Mr. Nimoy starts at 18:10 min and you can listen to or download the show here. Go here for the interview. Podwom has up an interview done by phone with Leonard Nimoy talking about the Full Body Project, Spock and the new movie, new cast, voice acting, being a public figure, the Identity Project, and Fringe. The interview has also been uploaded to YouTube in two parts. A Halloween double feature complete with aliens and dinosaurs. First, join Leonard Nimoy and other actors from STAR TREK and STAR TREK: THE NEXT GENERATION as they recreate the classic radio thriller. Originally performed by Orson Welles and his Mercury Theatre of the Air, WAR OF THE WORLDS is truly the mother of all space invasions, offering a rare combination of chills, thrills and great literature. Then, Arthur Conan Doyle’s rollicking adventure tale THE LOST WORLD follows a scientific expedition deep into the Amazon jungle – right back into the time of dinosaurs and cavemen. The broadcast includes a conversation with Leonard Nimoy and a special insider's tour of the Dino Lab at the Natural History Museum of L.A. Listen to this interview or download it at npr. They also have a few photos online that are worth checking out. While Jenkins says Nimoy's performance as Spock was a marvel of sensitivity and nuance, he is looking forward to a new actor playing Spock in an upcoming movie. Jenkins is brave enough to make a comparison to Hamlet: Like Shakespeare's conflicted hero, Jenkins says, Spock is a character for the ages. "We can imagine seeing hundreds of different actors play Hamlet, and indeed the richness of Hamlet is seeing differences and the different interpretations of that character," Jenkins says. "With the new movie, we will for the first time see Spock as a character larger than an actor." Listen to it or read the transcript here. Leonard Nimoy was interviewed by Fat Free Film, an independent film school, a while back. Topics talked about include: "being an artist in the entertainment industry, choosing projects, artistic expression, the importance of having a sense of humor", making Deathwatch and the positive side of being typecast. "SIMON: You note this book for the photography teacher who once told you to do what scares you. Now, your respect for these women notwithstanding, was that part of your fascination with this? Mr. NIMOY: Actually, it began with an individual lady who came to me after a presentation I was doing. It was a seminar of some previous work. And she said to me you're working with a particular body-type model, which was true at the time. She said, I'm not of that type; I'm of a different body type. Will you be interested in working with me? And she was a very, very large lady. And this was in Northern California - I have a home up there - and we invited her to our studio in the home and photographed her there. (...)"
National Public Radio, November 3, 2007. You can read the transcript of the interview, listen to it, or download it here. The download link unfortunately doesn't work anymore. Did somebody download or tape this in 2005 and might share it? Many of our recent scientific advances were first predicted by science fiction: cloning, genetic engineering, even a computer that can beat you at chess. Does science fiction help us prepare for the future or fill us with fear? And are real scientists influenced by science fiction? This hour, we'll talk about the relationship between science and science fiction with special guest Leonard Nimoy. 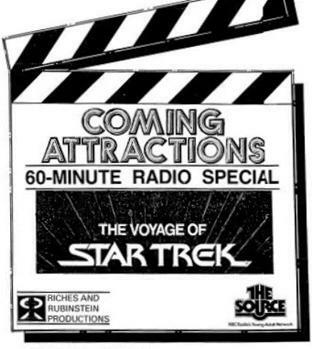 Trek Movie found a rare radio special produced on the occasion of the premiere of The Wrath of Khan.